"I may take up playing the clarinet." when perfect in every way. almost first thing every day. though I’m not your pet lap dog. 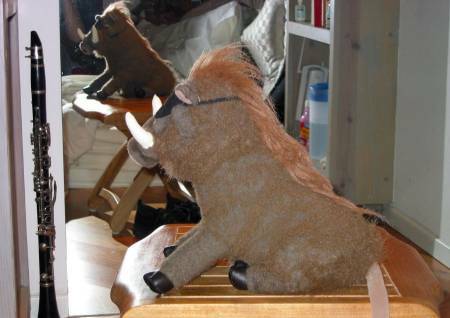 the world’s most handsome Warthog! I always know what to say. the people flock to my door. to want to be with me more. they all clamor at my feet. it’s just natural I suppose. but why on earth should I care? while I have luxurious hair. they add to my worth! I’m never lonesome, you see. I know just what you’d say. “Look at me! Can’t you see? I am one hell of a hog! when you’re the wheel not the cog! that I’m tough an’ a bit proud. Bet they don't know what it means. with the way that I fill out my jeans. don’t hold back your praise.